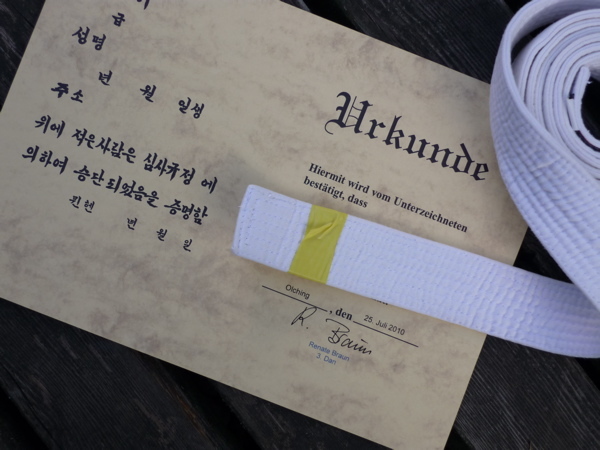 Since today my son is the proud owner of a bit of yellow sticky tape on his taekwon-do belt. I’m very proud. How old is he? I’ve been trying to persuade our 6yo to take up something similar with zero success. But then, he’s a teenager in a year one body. My son is a teenager at heart too (he’s seven). His teacher recommended having him do some sort of martial arts since he’s quite the intellectual but still has quite a bit of frustration and anger to vent. I love that he is doing something physical for a change and in a very structured way too. He is quite open to try new things. I just told him how much fun my self defense and sword fighting classes were, and then I just enrolled him. He is one of the youngest in his group, and certainly one of the smallest. If your son is anything like mine persuasion won’t work, ever. But he did like the idea of learning how to fight without getting hurt in the process. And that martial arts teach you how to defend yourself even if the other one is bigger and stronger. And with all his braininess he’s still a seven year old boy who thinks fighting is cool.